Is this humble 500-series processor the start of a great modular system? Library of radio–friendly rock instruments! The ADR F760X-R Compex compressor/expander was a favourite dynamics processor during the 70s and 80s. This classically styled mic incorporates Cloud’s own preamp design to negate some of the pitfalls traditionally associated with ribbon microphones. Is this Dbx’s most user–friendly feedback suppressor to date? It’s not easy to create an analogue multi–band compressor that competes on quality and price, but Drawmer show us it can be done. Nine years after its original launch, Eiosis have rebooted their Air EQ plug-in with some unique new features. IK Multimedia’s iRig Pads brings portable control to your computer or iOS device. Mackie’s mixers have earned a reputation for offering excellent value for money. We check out their most affordable range to date. While an overdrive pedal might not seem like an obvious studio accessory I’ve often found that using an analogue overdrive pedal before a software modelling amp/speaker produces more musical results. Nearly 30 years after production of the original U47 FET ceased, Neumann have revived this iconic large-diaphragm capacitor mic. It is often desirable to mute a microphone easily and this unit might be just what you're looking for! PreSonus have expanded their AudioBox range with two compact interfaces that will work with your Mac, PC or iOS device. Whilst PSP’s basic design remains the same, with a graphic display of the overall EQ curve and controls for up to five parametric EQ bands. Almost every aspect has been enhanced in some way or another. A combination power soak, DI box, speaker simulator and phase alignment tool, Radial’s Headload has a role in almost any guitar rig. Roland’s JDXi crams an awful lot of synth into a very small box. With The Hammersmith, a conventionally played acoustic grand piano, Soniccouture have released one of their most mainstream and potentially important libraries yet. This useful piece of software can help you streamline your projects and preserve precious system resources. Spitfire Audio’s BML range packages a full orchestral library into 20 individual modules. For such a simple-looking box, decked out with one knob, two buttons and no display beyond a single LED, the TC-Helicon Ditto Mic Looper is a very sophisticated piece of kit. TSOP’s first product is a Kontakt instrument called B11X, which was created by sampling every key and sound generator of a rare Polish synthesizer made in the 1980s. You get two for the price of one with this review, with two closely related sample libraries from Ueberschall. A Waves plug-in based on the original hardware Dbx 160 designed by engineer David Blackmer in the early 1970s. Serum’s slick interface belies an extremely flexible wavetable synthesizer. When screen space is at a premium, it’s time to customise Digital Performer’s user interface. Before you deliver your Pro Tools project to a collaborator, it’s vital to make sure it has everything they’ll need! The right reverb treatment can turn almost any sound into source material for filter mayhem in Studio One. Audio files to accompany the Studio One article. This page contains a directory of all media pages that hold the associated media for July 2015. What are the pros and cons of the different types of microphone, and when would you want to use them? We look at advanced mixing techniques in Reason. Take some of the work out of your workflow, with Cubase 8 Pro’s Plug-in Manager. We show you how to analyse a song using Live’s built-in tools. How to polish your vocal recordings in Sonar. Recording and producing your own music is always a challenge — especially if, like Faith No More, your previous albums have been done by the best in the business! Oasis’s 1996 gig at Knebworth marked the end of an era for point–source PA. We asked the people who made it happen what has changed since. When Does Technology Make Things Too Easy? Guitar synthesizers have been around since the mid-1970s but have never really captured the imaginations of the majority of guitar players. It’s always vital to give the client what they want. Even if what they want makes no sense. Hollywood looks like it may be on shaky ground, but it’s not all bad news for audio post houses. In over 30 years in business, Miloco has developed from a small independent studio to a venture that is operating worldwide. 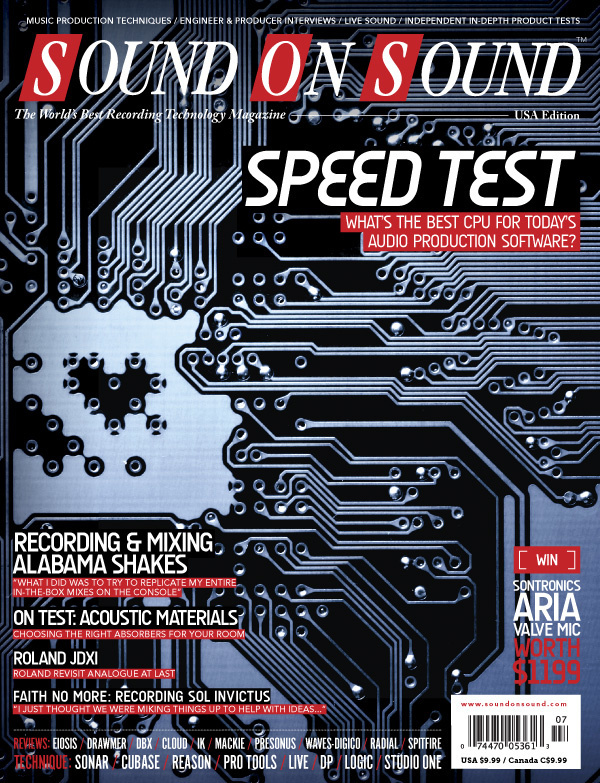 Media content for the July 2015 issue.